I am so delighted to announce that now there are TWO great ways you can learn acrylic pouring. The popular Getting Started with Acrylic Pouring ebook is still available and is a great introduction to pouring, with 4 exclusive videos, and all the links, details and explanations you need to get great results with your pours, even if you are brand new and have never painted before. Now there is a second expanded and improved way you can learn. Readers wanted more - more videos, more topics covered, troubleshooting, help with paint consistency and another recipe idea for use with different paints. So the book has now become a full online video class with absolutely everything you need to know from picking out all of your paints and materials, through to finishing and even selling your paintings. A feeling of happiness, relaxation, and satisfaction with every pour! The Acrylic Pouring for Beginners class runs on a fully optimised site that works great on laptops, tablets and even phones. For a limited time, we're offering a 10% discount off the full price of the class. 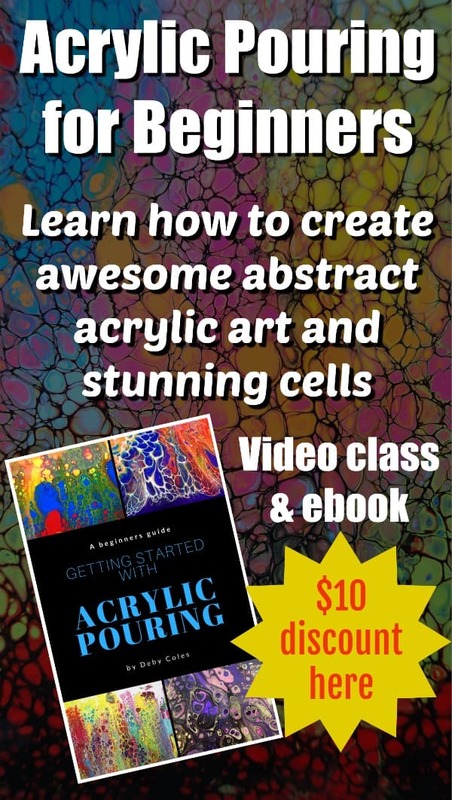 Remember that it also includes the Getting Started with Acrylic Pouring ebook that you can download as well, making this class already excellent value for money. Even more so with your discount! With that ringing endorsement, click through below to check it out. See you there soon.